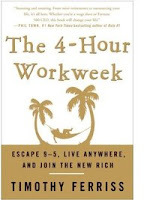 This book review is about The 4-Hour Workweek, written by Tim Ferriss, a self-described serial-entrepreneur, scuba diver, tango dancer, and world traveler. The book is about how to live a meaningful lifestyle without delaying retirement and without wasting your life. This book has many "coach-like" tools and techniques which leads me to believe that Mr. Ferriss has at one time had a business or life coach who guided him in developing these principles. As entrepreneurs we often dream about freedom – freedom to live a life of our own choosing, freedom to travel internationally to exotic locations, and freedom to create our own schedules. Why should we wait unit age 65 to live the life we want? Why should we slave year after year to make someone else’s dreams come true when we can take control of our lives and live the dream now? Ferriss breaks people down into two groups: the Deferrers and the New Rich. The Deferrers (D) work like the devil 80 hours a week to make the money to finance a highbrow lifestyle. They slave, save, and then retire. The New Rich (NR) design their business to finance a more meaningful lifestyle that includes travel, hobbies, and outsourcing. Does your Life have a Purpose? - What do you stand for? Are you working just to work? Are you buying new and better “things” but feel empty inside? Does your life have meaning? What are you contributing to the world? Figure out why you are on this planet and vow to live a life of meaning by contributing something of value to this world. Create a Virtual Business and Delegate – create a company not a one person shop! Have others do the work for you. You’re a CPA that focuses on tax return preparation. A client is looking for someone to do their monthly accounting. Take this client and delegate or farm out the business. Put procedures in place for how your clients will be handled. Ferriss goes into detail about hiring Virtual Assistants (VA) to do much of your "busy" work for you so that you can concentrate on the important details of running a business. Simplicity and Space – Did you buy a bigger house to hold all your possessions? Are your closets full of stuff you rarely use? What big-boy toys do you have but rarely use? Create space in your life to live. Clean out the clutter that prevents you from living a life of meaning. Get Rid of Your Unprofitable Clients – when we've reached a certain level of success we can muster the courage to pick our clients based upon certain parameters, namely how much we enjoy working with them and how profitable they are. Some entrepreneurs chose to refer the unprofitable clients to someone starting out in the business, usually for a referral fee. The profitable clients are retained and used to grow the business. Time Management – one of the major points of this book is how much time we waste by trying to "stay busy" rather than being "productive". Email is now our enemy rather than a tool to help us manage our business effectively. Ferriss points out that he checks his email only once per week. I'm not sure how easy this would be for the majority of entrepreneurs. I am certainly aware of how email is a time waster. I personally don't check or answer email on the weekends. I use that time to live my life. How often have you been "busy" the entire day, but when you look back you can't quite put your finger on what you actually got done? Focus on Your Strengths, not Your Weaknesses – as a business coach for entrepreneurs, I support this notion wholeheartedly. All too often I hear about business owners who are trying to "fix" the things they're not good at. I'd rather see us delegate weaknesses, and do what we're REALLY good at – and do it well. The book also goes into depth about how to create a business that runs on Autopilot (MBA - management by absence) based on product creation and internet sales. Of course, automation is the key!!! While I think this is an extremely beneficial book for entrepreneurs and small business owners, I also believe it proposes some out of the box solutions to common problems that will take some getting used to. However, I believe it will take some radical changes to "fix" our overly complicated, revenue-driven, valueless lifestyles. This book is a good read and I recommend it for all entrepreneurs seeking a better quality of life.